Mandarin oranges are rich in vitamin A and vitamin C. Due to the fact that vitamin A is a carotenoid that can be converted into provitamin A. There is no need to worry about overdosing. Vitamin C in a similar manner poses very little threat to your health as it is a water soluble vitamin. 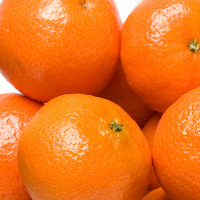 The calories in Mandarin Oranges per 75g(1item medium edible part) is 34 calories. Mandarin Oranges is calculated to be 45Cal per 100 grams making 80Cal equivalent to 177.78g with 8.63g of mostly carbohydrates、0.53g of protein、0.08g of fat in 75g while being rich in vitamins and minerals such as Vitamin C and Vitamin A Retinol Equivalent.